The Earth Prime Superboy first appeared in DC Comics Presents #87. Little is known about the life of the Superboy of Earth-Prime . . . whose impact on the DC Universe is confined to the event known as the Crisis On Infinite Earths. Superboy of Earth-Prime was only the second superhero known to have appeared on his particular parallel Earth (the other being Ultraa). On this Earth, Clark Kent assumed he was just an ordinary boy, and super-heroes were a thing of fantasy only. He had read Superman and Superboy comics from a young age, and his fondest wish was to get super-powers like his idols with the same name from his comic books. Mysteryously, on his 16th birthday he gained the full set of Kryptonian super-powers! This Clark Kent evidentally was Kryptonian as well, but had never known it! 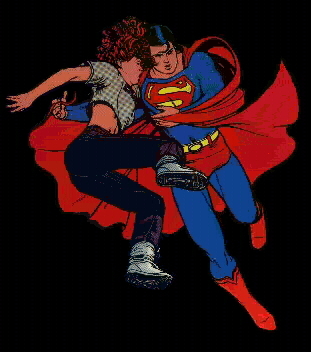 Since super-heroes are truly a rarity on his world, this Superboy was never affiliated with a Legion of Super-Heroes. The Earth-Prime Superboy became known to the other heroes of the DC Multiverse during the Crisis, as he was the sole survivor of his Earth, which was claimed by the Anti-Monitor's anti-matter wave. After first encountering the Earth-1 Superman and sharing his first known adventure with him, Superboy of Earth-Prime joined the coalition of heroes gathered by the Monitor's assistant Harbinger to do final battle with the Anti-Monitor in the anti-matter dimension of Qward. With Alexander Luthor of Earth-3 and the Superman of Earth-2, Superboy of Earth-Prime was instrumental in the final defeat of the Anti-Monitor. Left without a world to call his own following the Crisis, the Earth-Prime Superboy joined the Superman and Lois Kent of Earth-2, and Alexander Luthor of Earth-3 in the Paradise dimension. They have never returned from this dimension. The Earth-Prime Superboy has super-strength, the power of flight, super-speed, super-breath, super-hearing, super-vision (including X-ray, heat, microscopic and telescopic visions), and invulnerability to any other force than magic and Kryptonite. This Superboy is also assumed to have the power to travel through time under his own force.